Discussion in 'Lost Grounds' started by Haseyo, Dec 9, 2013. What's your favorite .Hack// series? This roleplay is going to be primarily set in .hack// itself. 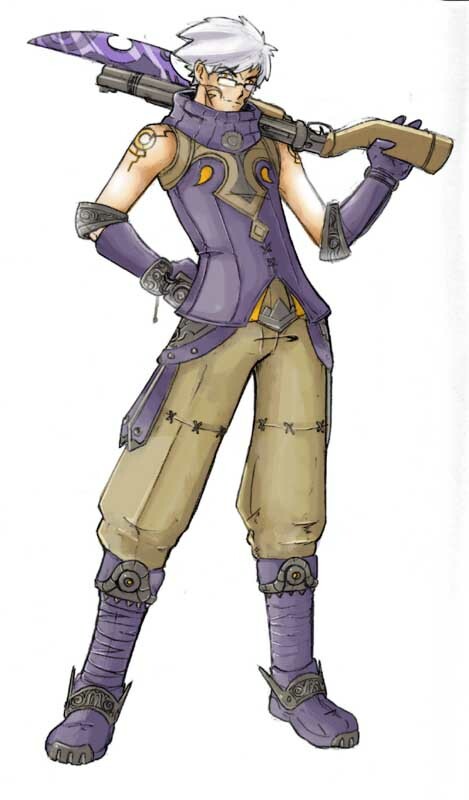 I tend to roleplay canon characters rather than OC's so I thought a .hack// set up would be nice. OC's are more than welcome to join though. Ghost Falcon- Using his twin blades, he unleashes a fierce aerial attack that sends his enemies into the ground. 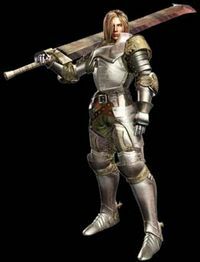 Armor Break- Using a Broad Sword, he lunges at the enemy and delivers several heavy blows while digging up rocks with his blade. Reaper's Dance- A scythe based move that unleashes dark aura from the ground and sweeps the enemy into the air for a critical hit. Melee & Double Trigger- A move used for his dual guns. After firing off several bullet rounds, he lunges forward to use the blades on the front of his guns to slice at the enemy in an 'X' shaped motion. Soon after, he can swiftly change to any of his four weapons for another attack. Judgement- Another dual gun based attack associated with double trigger. If Haseo chooses to use his dual guns for his double trigger, he will perform three more bullet shots, the last one being the most explosive and causing more damage than the rest. Beast Awakening- When his moral gauge fills up, he can use an awakening to increase the amount of damage he inflicts for a short period of time. Skeith Awakening- Rarely used. Only for desperate circumstances or things involving AIDA. Haseo calls Skeith, the first phase of Morganna from within his PC. Regular PC's cannot see him and it makes for an instant K.O. That being said, it can also throw the people inflicted into a coma, thus why he never uses it on regular players. Important Info: Haseo's appearance itself stands out for the fact he has a hacked PC, making for some odd stares. 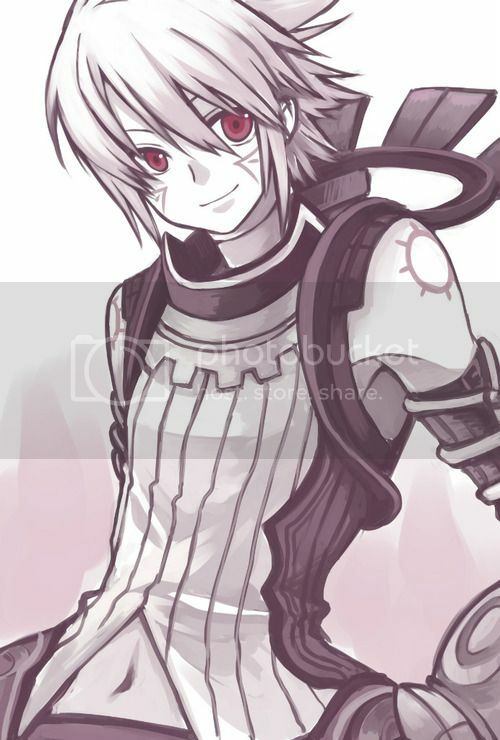 Bio: Haseo can be a cold person in general. His rude and sometimes obnoxious comments result in other's being angry at him. Though out the entirety of G.U., he has softened a bit. Making him easier to get along with. He may not be "warm", but he makes a great leader and is willing to risk everything for his friends. Despite all this, he wishes to leave the past behind him and the things he regrets. Most famously, his title as "The Terror of Death" for PKing hundreds of players in a blind rage to save someone dear to him. If you have the patience to get along and get to know him, you'll easily have a loyal and trustworthy friend. Nickname(s): Guardian of the Stars. Star Swords: he creates three swords from thin air and launches them at his Opponent. Stardust Triangle: The user and two other group members knock the chosen enemy in a triangle like motion dealing between 15-50 damage 5x it finishes with their most basic attacks combined. 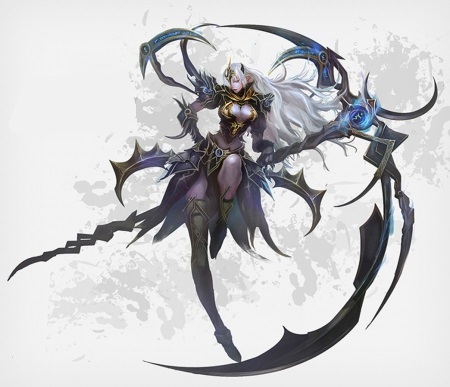 Cry of Twilight: He summons his scythe and strikes the enemy for massive damage Yuusei is stunned 3 seconds after using this and is unable to use it again in the current battle should it hit. Guard of Twilight: 25 %Damage dealt too Yuusei is shared with the enemy. Last two attacks. Sacrifice: This skill allows Yuusei to take the blow from an enemy's attack if the attack would kill. Yuusei's hp is reduced to 1 instead. Important Info: Though nothing seems to be special about him he is able to see Avatars. Because he can see Avatars people believe he is hiding a secret power. Bio: He is generally nice and will go along with things but if he feels something bad with an idea hes not afraid to fight his friends to stop them from going there. All he does is sit on top of a certain mountain every day it seems like as if he had nothing else to do. He was always seen sitting under the stars thus he gained "Guardian of the stars" as his title. He doesn't exist as an outside player how he came into the world is still a mystery. Misty Vail: The Player turns to fog and vanishes. He will reappear soon after that in an area of 200 meters. Stinging Fog: Only usable when Player is in his invisiable fog form. The fog slowly gethers around the target and the weapons of the Player attack the target from every direction. Valley of Mist: A thick fog spreads over a large area. You can only see the outlinings of objects or persons anymore. The Player can either attack the target wich would cause the fog to disappear after some hits or just sneak away and leave the target searching for him in the fog. Foggy Staircase: The player is able to build a staircase of fog to either escape his target into hights where he can't reach him or to get above his target to jump down on him with his blades. He could also just use it to acces higher places like rooftops. Important Info: His two blades are named Fog & Dust and have the ability to disappear for as long as the player wants to. Bio: Latorn is a quite guy and likes to keep to himself. Some may even call him mysterious because he's just sitting around watching other players pass by but never talking to anyone or leveling up. Noone knows how he got to level 68 since he was never seen killing any monsters. His hair is dark grey, pretty short and spiky. He's wearing a black, brown and dark blue robe with long sleeves and an eye symbol on his back. 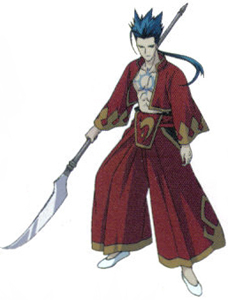 His two blades are, as stated above, only visiable when he wants them to be. He has dark blue eyes and a long scar on the left one of them. On his ears he has some rings and piercings. He's 1,78 meters tall and not too muscular but very agile. Bio: After a five year hiatus from The World Zhu Ran has finally returned. 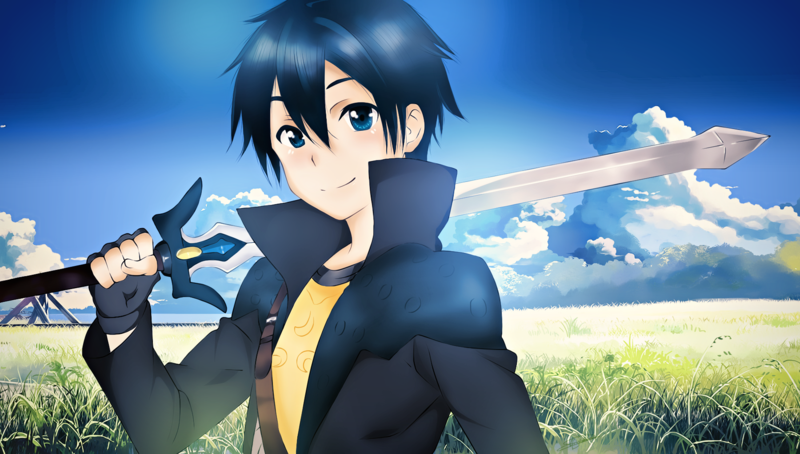 He is now looking for the rest of his guild while also trying to find the secrets that this new and improved world has. Crim is a very happy-go-lucky player. He enjoys living on the edge and testing his skills against strong monsters. As a self-proclaimed defender of justice, he never turns down a chance to help somebody in need, especially not if that person is a pretty girl. He used to be a member of the Crimson Knights, but left when he felt that it was tying him down. He prefers to keep the real world and the game world separate, and will take breaks from the game if he feels it's getting to be too bothersome. Crim's player is a Businessman. He spends long hours at the office, and is frequently sent off on business trips to places all around the world. Playing The World is Crim's main hobby, though he's also a big fan of books. Interestingly, Ryo Sakuma is one of his favorite authors; he frequently uses quotes from his books in the game. Skills: Flaming strike: Does a medium amount of damage, but engulfs the ememy in flames for ten seconds (Flames are made by the friction as the strike hits the enemy's body. Slash: Basic move that does average damage to the enemy, but takes little time to prepare for it; Can be quickly used again. Backend: Acts as a counterattack, right after the enemy hits, you jab them with the elbow. Important Info: Uses Bowie Knife ----Fun little back story I wrote. A young boy who was very smart and educated,but yet brave and firence too, was abondened at the age of nine was left in the jungle alone. As he wondered he came across a old temple,so he took shelter there for the night.He couldnt sleep so he wondered the temple, and came across a treasure chest that was unlocked, inside he saw a knife. He took it and it showed him visions of fire. He swung the knife at a nerby stone and a flame roared out of the blade. Bio:A hoplessly optimistic shy boy, who is daring to try things even if risks are high. He prefers to be alone, but does not mind some company to go along with him. He never had a rough life of on the streets or being abondened, so he is pretty relaxed and loves to laugh. He will get serious when he is very focused and when things get very tense. When he goes offline, it is either it is late or he has school. He does not like to talk about his hobbies, for he will be made fun of having them. But even when he gets frusterated, he will not stop untill he achieves his goal! Bio: Being a gamer, it was only a matter before he had come across it, especially how it'd had turned out he liked the game. He started out saying small things about the game, but now to others, it is at an unbearable point. After that long while since then, he put his life into the game, becoming a shell of himself, until however, he realizes that others in his game had a life to attend to , and it could be that he needed that as well. He had taken time off the game, to try something more outgoing with his life, and began eating healthily again, but whenever he came back, they'd deleted his account, for all that time he took off from The World. He created a new one, and is starting out anew. Important Info: Childish and pretty stupid, he'll often make silly mistakes and not quite understand things the first few times he's told. Troxin looks nothing like the character model he chose. Bio: Troxin is a primary school student with an obsession with computer games, he doesn't have many friends in real life but tends to play quite alot of games on the internet due to this. He'll often say random stuff when he forgets to remove his headset to talk to his family. He has an older brother who has been playing The World for years but has only recently managed to persuade his parents to get him a computer of his own to play games on, he's very happy since he no longer has to jump off the computer whenever his brother needs the computer. This is Troxins first time playing in The World. Imagine a Heavy Blade sword in place of the sword he's holding. My first time playing as a young character, lets hope it goes well. Will update the profile as the character progresses. Important Info: He is generally weak to physical attacks, but boasts a resistance to status, and magical attacks. Due to his weaker physical defenses, he prefers to battle at a distance using his Rifle, or explosives he has with him. He does adequately a close up fighting, but normally loses in such situations. He normally stays away from groups, but doesn't mind joining one. Bio: Tryndivar has been in "The World" for awhile, and is getting a good grip on things in the game. He is mainly a Gun-for-hire, but is willing to help those who are in over their head. His main passion is gaming in general, so he works at a small game store, so he is able to play games quite a bit with his free time. Picture:- He is about 6ft4in tall, has dark brown hair cut into a crew cut hairstyle.to keep the sun from messing with accuracy. He wears a pair of sunglasses His armors main color is green, with black accents, his pants are light brown. He also wears a bandoleer as a belt. Important Info: She's a former solo player. Bio: Her brother had to go on a business trip which made her be able to log into .hack for the first time. Due to this, she was not able to play The World: R1 and joined The World: R2. Chains of Casualty: Chains of an untangle dark metal spring from the ground to Snare the foe in it's grasp. This inflicts Slow on the target. When the victim is struck however the chains snap one by one, inflicting heavy damage to the victim. 5 Chains total are placed on a target when used. Chaos Cacophony: The user emits a scream that echoes in the ears of the user's victims which vary in tones. This lingering tone of noise disrupts concentration and causes malfunctions in spell skills cast by the victim. Pandemonium: The user lets loose a cry that inflicts Beserk on all targets in the area. Beserk'd beings attack anything around them, be they friend or foe. This ability does not work on Boss creatures. Grand Impact: Weapon Skill where the user swings his mace horizontally and collides with the target. This skill is an Armor Break Skill. Falling Star: The user jumps into the air and brings his/her mace down upon the target. This deals a heavy amount of damage and Armor Break Skill but requires more SP. Doom Siren: The user bellows out a scream that affects targets in a cone shape infront of the user for up to 5 feet. Any target, with the exception of Boss Creatures, hit with the blast of sound are knocked off their feet. This is used as a CC(Crowd Control) as it deals no damage. This Job was a finely balanced creation of Magic and Weapon. While Harvest Clerics are known for their Healing, and Shadow Warlocks their magical Damage with a weakness in the other's department, the Macabre Dancer was a master at both types. However there was yet to be a balance between Magic and Weapon skills. To answer this Tetsu created the Doomsayer Job Class which specializes in Curse-type Magic which weaken foes while wielding a large Mace to deal heavy physical damage. For the price of these boons, the Doomsayer had a heavy restriction on it's Healing and Damage Magics, as well as a very slow attack rate. The Doomsayer was also restricted from using Heavy Armor and limited to Medium or lower. With great delight, Tetsu recieved a reply to his entry notifying him that he had won the contest and, just as the Contest stated, CC Corp would incorporate the Job Class as a special Job Quest, make the Job Quest extremely rare and based on in-game Conditions, and grant Tetsu a special Job-Change or allow him to create a new account as his Custom Job. Of the choices, Tetsu chose the latter. He had not progressed far on his Shadow Warlock, and beginning anew granted him the ability to alter his appearance. And so Sigan's Saga began. It has been one full year since the Contest came to a close and Sigan first entered The World. During this time Sigan was confronted with the ravaging guild Kestrel and it's PK members. Sigan, very nearly having been PK'd himself as a lower level player, vowed to make players such as these pay. His goal made his heart cold, his happy nature turn to cautious plotting, and his friends list to plummet. However, becoming a PKK did give Sigan even more fame in addition to his special Job Class. He gained the nicknames The Hellfire Heretic, and The Demonic Priest of Death due to the way Sigan would give a small sermen or lecture while he slayed his foes, feeding off of their fear and despair. Now Sigan is debating on trying to form a team for an Arena run, just to test his skills in an enclosed combat zone. Quote: Life is the only thing worth taking, everything else can be bought with gold. Width (at widest area/Spiked Orb-End) – 6"
Description: 6'4, shoulder-length dull white hair, moonlight silver eyes, thin build. Important Info: Always seen wearing a large pendant around his neck and an odd bracelet that he never uses, claiming it be a gift from an old friend. He is goofy, aloof, and quite loveable when he's not angry. When in battle he goes into what he calls concentration mode, where he goes completely silent and becomes a killing machine. As he was PKed many times as a new player, he became enraged quite easily, soon being able to take down IYOTEN, a very well-known PKer...becoming another PKK. Despite his goofy nature, he is actually incredibly intelligent, able to outsmart Even Pi of Raven, one of the most well-known "thinkers" in the game. He is highly skilled in combat with his Edge Punisher class and is oddly faster than most in battle for unknown reasons. If enraged, he has been seen wielding an entire Edge Punisher blade with one hand throughout an entire fight and getting an odd berserk aura that looks like black flames around his character, prompting his suitable PKK nickname the Black Dragon. Bio: A player dating all the way back to the original [THE WORLD], Corelion is actually well-known amongst the original players for his service to the Azure knights as Corelion of the Azure Abyss, and his association to Piros the 3rd and Natsume, two of the dot.hackers who saved the original game. When the day was saved he would hang out with Natsume after the disappearance of Kite, Balmung, and the resurrected Orca, his fellow Azure knights. When the change was made to the R:2 version of [THE WORLD], he was given the chance to renew his data, but declined as he wanted to start fresh, hence his much lower standing in the game. Now, with Natsume's reappearance alongside Haseo, a fellow former PKK and his own Guildmaster, he steps in alongside Piros the 3rd and Natsume at times when the search for the AIDA virus' takes place. Hearing from Haseo that Kite, Balmung, and Orca had resurfaced he became overzealous and...actually hugged him, making any interaction between them awkward now. Important Info: while being a mage she doesn't always like to be at the back firing lighting bolts off. so to fix that she lurned some stealth skills. Bio: likes daggers. hates slimy and sticky things they freak her out. and favorite motto is why should i just zap it when i can stab it than cook it like a pig when it turns around. and has a bad habit of attacking anyone acting perverted with the nearest blunt object. Picture: long simi curly blond hair just below the shoulder. is on the tall side around 5,10 will often where a dark blue or black clothes rarely seen with out a skirt. always has a long sleeved top even in summer and is always in boots or flats will never been seen in high heels. and will always have a knife stashed someone on her. Evaporate: Becomes a cloud of mist for a short period of time. Morph: Becomes a small bird indefinitely. Important Info: Weilds daishō, but favors the wakizashi in most situations. Bio: With no memory of origin, Atlas has existed (seemingly) since the system came online. Recently, he(? )'s considered that he may not exist outside the coding of [The World] which raises many conflicting emotions and concerns. He has developed several skills to mask his presence within the game. 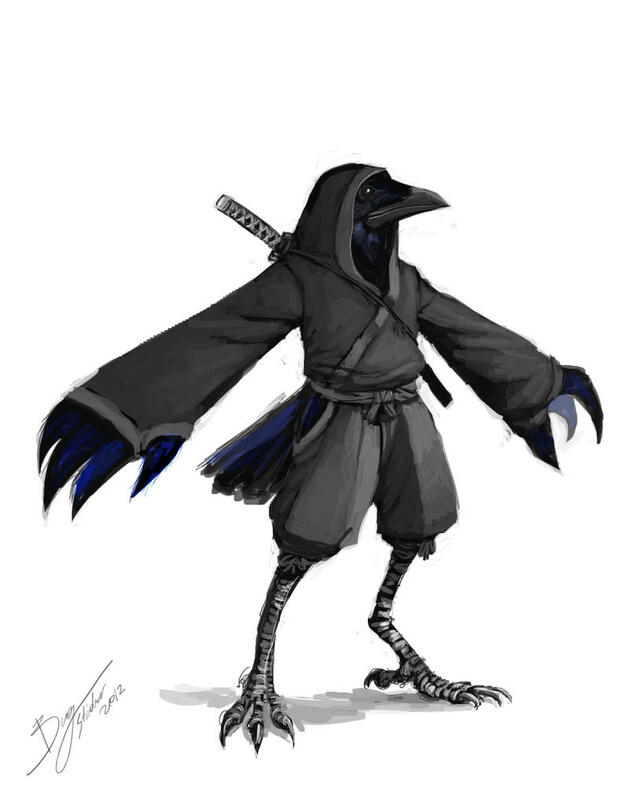 He appears as a bird (see below but as a blue jay) earning him the name "Jay" to the few that acknowledge his existence. Important Info: Six years ago, Max was the man at this game. He ran with the highest-level parties into the most dangerous parts of the server. His character was kitted out in the top-level gear for top-level PCs, and he looked, in his personal opinion, sweet as heck. That was before he had kids. It turns out you can't stay at the top of an game like The World while raising twins. He spent his time split between work, parenting, and (not enough) sleep. This summer, though, something miraculous happened: The twins were old enough to go to summer camp for a full week! He's taken the week off work, too, just so he can sink some real hours into this game for the first time in ages. Now, he's back on his old server, hoping to find some action. 50 is still the level cap, right? In real life, Alfhild is a college student whose parents are wealthy, though not absurdly so. Just wealthy enough that they sent Alfhild to college without much thought, expecting him to take it seriously. Alfhild would normally have done so, as he had taken high school seriously, but he hadn't given much thought to what career he wanted to go into. As such, he looked for something to sink time into. The World was a viable candidate, but newbies were rare, and most people who played games at all played The World (unlike Alfhild, who'd avoided it, thinking his grades more important). Alfhild avoided starting for that reason, but some of the forums he followed mentioned that there was a blip of activity on long-abandoned Server//1543. Thinking it the perfect chance to start, he finally gained the courage to say "New Character". Guild: "Child of The Scythe" or "CoTS"